These words from Joan of Arc became my mantra in the days before our planned Extinction Rebellion action at the Houses of Parliament. I was sitting with my fears, knowing the likelihood of arrest and my responsibility as a single parent – something which made me certain I would not take part in an arrestable action up to this point. And yet my heart urged me on; reminding me of all that I love about life and nature, the pledge I had made in 2012 to live in service to the trees and our ancestors, and this deep calling to protect what I care about and inspire radical change in the way we perceive life. I have been a committed earth protector these past 7 years, and yet I am new to the activist path. I was wary of protest and fanning the fire with more anger and hatred. So I devoted myself to inner healing and re-wilding my soul to weave myself back into the fabric of nature. In so doing I began to feel the grief and pain of the earth and its creatures, and became overwhelmed with the enormity of the mission to bring about healing our sense of separation, which is perpetuating our destruction and endangering the future of live on earth. 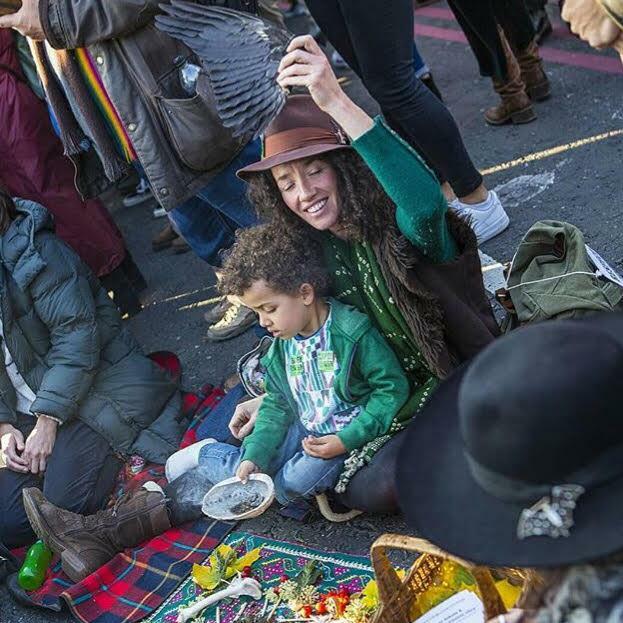 When Extinction Rebellion put their Declaration to Parliament last October, I felt a renewed surge of possibility and when I gathered with others to shut down the 5 bridges in London, with my son beside me, I was filled with inspiration, hope and a real sense that the tide is turning. We are ready. Too many of us have seen behind the veil and cannot be blinded by the belief systems and cultural dissonance that have kept us feeling disempowered, in denial or paralyzed by fear. Those systems are breaking down but the alternatives are not yet clear. We are in a period of chaos, death and destruction that precedes rebirth, our collective ‘dark night of the soul’. We need to transform our human operating system, reframe our entire paradigm and the perception that we are separate from nature. This might seem an impossible task, but what if this is our human destiny? What if we re-imagine the human story, remembering our boundless potential and creative gifts, and dream a new world? Do you believe that heaven on earth is possible? I do. When I was invited to take part in the action at the House of Commons I felt my spine tingling; sensing the whisper of my ancestors calling. I couldn’t say ‘no’. I was terrified at first but as the day came to leave for London, I felt ready. I saw my fears as arrows pointing me to exactly where I needed to go to overcome my own personal sense of limitation, and that of our species as a whole. By facing my fear of arrest and baring my body I feel like I’ve transformed all that latent energy in to a renewed sense of power and purpose. For me, the stripping of clothes felt symbolic to shedding these barriers between ourselves and nature, to one another and our hierarchical structures. My body is a microcosm of the universe and laying it bare, nothing to hide, nothing to be ashamed of, was incredibly powerful for me. The experience in the House of Commons and the events that followed all felt infused with a sense of divinity, as though the hand of the Goddess was weaving it all together. 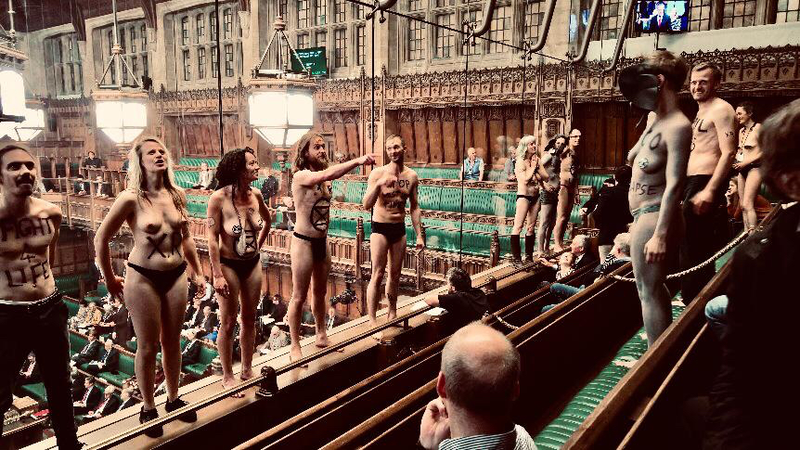 I was shaking when I stood with my hand super-glued to the glass, my bottom on show to the politicians below and body painted with XR symbols and ‘Climate justice NOW’. It was definitely an edgy experience, but I have never felt more alive! All senses on full alert, adrenaline and heart racing, a surreal sense of being disembodied at one point and looking down from above at the whole spectacle unfolding with joy and wonder in my heart. I was brought back to earth when a policeman came to remove my hand from the glass and I was escorted to a back room with my fellow rebels; all elated, amazed we had pulled it off, and celebrating a deep sense of solidarity and purpose. I was delighted by the events that followed; befriending the two policeman that were escorting me as we talked about our love for trees, shared some laughter and I serenaded them with African lullabies and mantras. One of them said ‘you are the nicest person I have ever arrested’, and it affirmed what I witnessed around me with all the rebels chatting and giggling with police officers, making real heart connections and infusing the situation with love. Extinction Rebellion are committed to non-violent direct action and this is vital to me. We may cause upset, anger and frustration when we hold up traffic or divert attention from Brexit, but with revolutionary love and kindness as the basis for all actions, we are creating more of that in the world. Extinction Rebellion encourages us to get creative with civil disobedience, be a little mischievous, and dust off your rebel shoes to dance away the shackles that have kept us tethered. And to have fun! This mass genocide that is currently our reality is desperately serious, but we are being called to become fully human - to feel all our grief and sorrow, joy and hope, connect with others along the way and share what gives us meaning. When I was in the police cell I realised I had never felt so free. And yet I had never been more literally imprisoned. Overcoming my fears, feeling that sense of solidarity, a shared sense of purpose and embodying my truth had created a doorway to emancipation that radiated from my whole being. I will not stand for the destruction of this beautiful earth and Extinction Rebellion are providing the inspiration, community and direction that I truly feel has the potential to bring about radical change. We need enough people to rise up, show up and speak up to make rebellion week effective. This is our opportunity, our birthright, to defend what we love and honour this gift of life. We can’t hide in the shadows any longer. The time is now. Join us for International Rebellion in London, starting on April 15th. The future is in our hands. Our way is up to us. Let’s make it count.